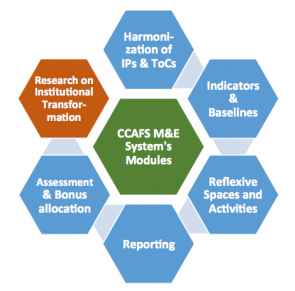 The Monitoring, Learning and Evaluation (ML&E) system of the CGIAR Research Program on Climate Change, Agriculture and Food Security (CCAFS) provides practical mechanisms and tools to ensure balanced quantitative and qualitative monitoring. The system is made up of a forthcoming set of modules (see illustration), elaborated in an online ML&E Support Pack. The CCAFS Monitoring, Learning and Evaluation (ML&E) strategy is intended to promote an evaluative culture. It was implemented to support Phase II of the CCAFS program, up until 2025. It adopts a results-based management (RBM) approach and supports a culture of reflective learning, experimentation, and adaptive management; ensuring that ML&E becomes an integrated mechanism throughout the program. The RBM approach helps to build logical chains of transformation in which projects produce tangible outputs in support of desired outcomes. These outcomes include changes in practices, skills and behaviour of researchers, policy makers, national extension services, farmers and other user groups. Focusing on users, utilization of ML&E and accountability: We want the ML&E system to be user- and utilization-focused, ensuring that when we invest in ML&E measures it is for a specific purpose and audience. Adaptive management. A strategic approach to deal with a constantly changing environment is required, which entails built-in reflection and learning. ML&E and flexibility to implement corrective actions when required is needed to strengthen predictive capacity. Allowing blurred boundaries. By proposing an integrated ML&E system, linkages are created with a number of other areas, including social and organizational learning, knowledge management, communications, data- and information management. In bringing together so many different areas, there is a need to ensure that work is complimentary, collaborative and value-adding.